Stowaway is a mission in Grand Theft Auto: San Andreas, given to protagonist Carl Johnson by government agent Mike Toreno from the Verdant Meadows Aircraft Graveyard, located in eastern Bone County, San Andreas. Carl is in the middle of the airstrip, apparently waiting for Toreno, when suddenly government agents arrive in trucks and a cargo plane. Feeling exposed, he hides behind some crates. A little later, Toreno sneaks up to him, saying that the people who arrived are from a rival agency. Toreno, having permission from his apparent boss, wants Carl to kill the agents by bombing the cargo plane. Carl, though reluctant at first, eventually accepts. Carl hops on a bike, and quickly makes his way inside the plane (which is taking off), dodging bullets from the agents and barrels falling from the plane. The plane eventually takes flight. Once on board, he carefully makes his way on to the back of the plane, killing several agents while doing so. He then places a satchel charge on the plane, then, using a parachute he gets from an agent on board, he jumps out of the plane, freefalling down to earth. Carl Johnson: Ah, what's Toreno up to now? Carl Johnson: I'm feeling a little exposed here! Mike Toreno: What's your take on this? Carl Johnson: Damn! I thought they was your people. Mike Toreno: Listen, Carl. We've got a problem. Some traitors from another department think they can help the 'oveseas situation' by financing militaristic dictators in exchange for arms contracts. Carl Johnson: Hey, ain't that exactly what you do? Mike Toreno: Well, kind of, but we get to pick our dictators. Degenerates that we can control. We try to stay the hell away from these guys with principles, because that just - muddies the waters. Mike Toreno: Anyway, the point is - you and me, Carl, we're the same. Now yeah, it's a dirty job, but somebody's got to do it. But if you screw this up, it causes a tinder box situation all over Latin America and the Middle East. Now look, I spoke to the big man. You've got clearance to eliminate these fuckers. How's that? Carl Johnson: Huh, man, killing Government agents? Mike Toreno: Kill, schmill. Come on... don't look at it that way, will you? Think of it as pest control. It works for me. All right, come on, I can't stay here now. I'm too hip, I gotta go. OK? I'm outta here. The reward for this mission is $20,000. The mission Black Project is unlocked. It is possible to steal the Andromada during the mission. If the player falls out of the plane without a parachute, an alternate cutscene will play; Carl will fall on a car in a drive-in theater and die. 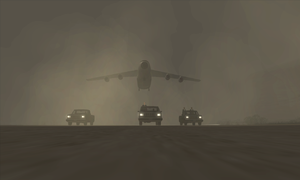 If the player inputs the "all cars blow up" cheat in the beginning of the cutscene and drives to the end of the runway, the camera will start to shake violently, presumably to prevent players from running away from the mission. Carl Johnson and Mike Toreno watch the government agents. CJ about to drive towards the plane. CJ chases after the plane on a PCJ-600. CJ about to drive up the plane's ramp. CJ fights without firearms against the government agents on board the plane. CJ dives out of the plane with a parachute and detonates a satchel charge on board. This page was last modified on 28 June 2014, at 20:04.